Hardcover, 9 x 11.5 in. / 152 pgs / 100 color / 50 bw. Essays by Siri Engberg, Madeleine Grynsztejn and Douglas R. Nickel. Foreword by Kathy Halbreich and Neal Benezra. 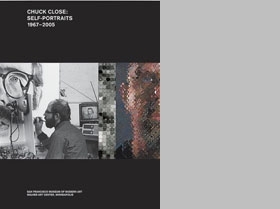 A celebrated, popular and influential figure in American art, Chuck Close has focused exclusively, and with great innovation, on the genre of portraiture. 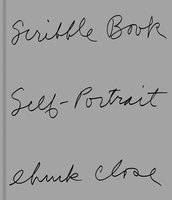 This exhibition, co-organized by the San Francisco Museum of Modern Art and the Walker Art Center in Minneapolis, explores the artist's work in self-portraiture over four decades and across a variety of media, including painting, drawing, photography, collage, and printmaking. 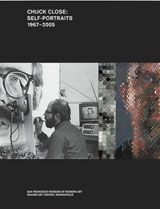 The first comprehensive museum survey of Close's self-portraits, the exhibition and its accompanying publication offer a fascinating glimpse of an artist's self-examination and evolution over time and elucidate his unbounded, process-driven experimentation with media and techniques. Working with the seemingly narrow subject of his own face, Close has produced a richly varied trove that ranges from intimately scaled collage maquettes and fingerprint drawings to monumental gridded canvases; from the sharp definition of certain photographic techniques to the ghostly blurs of daguerreotypes and holograms; from the tactile complexity of paper pulp editions to the smooth, mechanical surfaces of Polaroids and digital ink-jet prints; from the subtle tonalities of gray-scale paintings and drawings to the exuberance of an 111-color screenprint. When Close unleashes his imagination on his own visage, this familiar figure is at his most revealing. Edited by Jerry Sohn, Nina Holland. FORMAT: Hardcover, 9 x 11.5 in. / 152 pgs / 100 color / 50 b&w. Published by Walker Art Center/San Francisco Museum of Modern Art.